If this card is Special Summoned: You can excavate the top cards of your Deck, equal to the number of monsters “Fur Hire” you control with different names, except “Rafale, Champion Fur Hire”, and if you do, add 1 of them to your hand, also shuffle the rest back into the Deck. When your opponent activates a monster effect (Quick Effect): You can discard 1 card “Fur Hire”; negate the activation. You can only use each effect of “Rafale, Champion Fur Hire” once per turn. Rafale, Champion Fur Hire owns up to that title. Highest ATK of all Fur Hire monsters, the more Fur Hire monsters on your field with different names when this big guy is Special Summoned, the better. Excavate that number of cards, then add one of them, shuffling back the rest. While you could potentially excavate four to only get one, the more you excavate, the better chace you have at hitting something you really want. 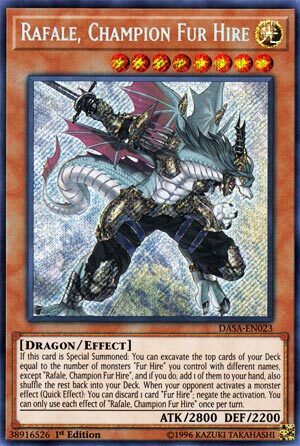 He is the negation monster of the archetype, using a Fur Hire card to negate a monster effect. Either turn you can activate either of these effects, giving it good synergy with Mayhem Fur Hire. Beat can add back a card for Rafale to discard, though I would’ve liked to have seen Rafale able to negate any effect by discarding. Still, he’s the champ for a reason: he’s the strongest, adds to the hand, and can protect as long as you have the resources. Also, the card added to the hand off the excavation doesn’t need to be a Fur Hire, a definite plus. Negating Boss Monster is Good. Rafale, Champion Fur Hire is a Level 8 Light Dragon-type monster with 2800 Atk and 2200 Def. Dragon support would work really well here. He’s also very strong without any effects. If Rafale is Special Summoned you get to excavate the top of your deck a number of cards equal to differently named Fur Hire monsters you control. You only get to keep one and shuffle the rest back, but it doesn’t matter how Rafale is Special Summoned. Replenishment on summon is good even if it is only once per turn. Then at the cost of a discard you can negate an activation of an opponent’s monster effect once per either turn as a quick effect. Rafale can destroy the monster later and this effect doesn’t target. This boss can stop other bosses and is reasonably strong, definitely worth running in multiples for Trade-In or Dragon Revival. Score: 4/5 Art: 5/5 Dragon with sword, hell yeah. In the middle of the week we got the boss monster Fur Hire: Rafale, Champion Fur Hire. Rafale is a Level 8 LIGHT Dragon with 2800 ATK and 2200 DEF. Stats are good for a Level 8. LIGHT is a great type and Dragon is a great attribute. When Rafale is Special Summoned, you can excavate the top cards of your deck up to the number of monsters Fur Hire you control except Rafale and add one of the excavated cards to your hand while the others go back into the deck. Nice little searching effect, though very limited. Any ways to gain advantage is good and this can grab whatever you wish assuming you excavate it. When your opponent activates a monster effect, you can discard one card Fur Hire to negate the activation. Nice negation, but it would of been nice if it destroyed, especially considering this effect like the first effect is a hard once per turn. Rafale is still a staple in the deck Fur Hire, acceptable as a three of as well considering getting it out is very simple. Art: 4.5/5 Might be the best looking monster Fur Hire. (the 2200 defense isn’t bad either, I hate when high level Monsters have high attack and low defense, unless absolutely necessary for balance or something). Rafale lets your excavate cards from your Deck up to a number equal to the number of differently named Fur Hire Monsters you control, excluding himself. That should likely be a few at any given time, (two or three I figure), and then one you can add to your Hand, while the others go shuffled back to your Deck. You can also discard a Fur Hire to your Graveyard to negate an activation of a Monster effect. Both effects are once per turn (the latter effect is a Quick Effect, which is good), and dumping Fur Hires to the Graveyard does help to continue to combo and fuel the Deck along. The negation effect is good and bad. If the Monster in question can only use their effect once a turn, it’s a lot bigger. If not limited in said manner, than there’s little to no reason at all to use Rafale’s effect (unless you NEED to dump something that badly. Still a fun card, powerful, and it does stuff. It could do it a little better, but still solid absolutely.